Two-dimensional Western blots are challenging to analyse. Identification of which spots on the total protein gel correspond to the spots present on the Western blot is often the biggest challenge. TotalLab Limited has developed a unique and easy-to-use software solution to address this challenge – SpotMap. Previously most 2D gel electrophoresis software packages were developed for differential expression analysis, relying on high numbers of images with similar spot patterns. Whereas the comparison of two-dimensional gels and Western blots is often based on a smaller number of images with very different spot patterns, SpotMap is the only software which has been developed to specifically address this need. 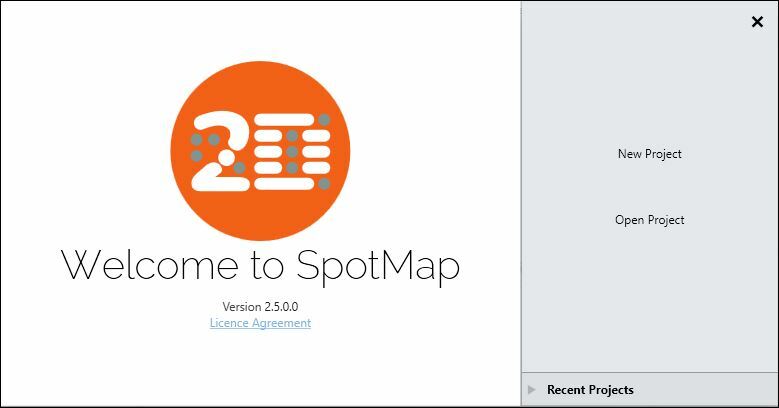 Designed to be an easy-to-use, reproducible and quick software solution, SpotMap creates a single spot pattern (the spot map) which is applied to all images in the analysis. Spot presence or absence on each image from this master spot map is used to identify those spots which are common or different between images. The ability to apply a single map to all images in the analysis is enabled by the alignment process. Alignment is a key step within TotalLab’s 2D analysis software, it removes the positional variation introduced during the gel running, Western blotting and imaging processes to allow direct comparison of corresponding spots between images. The process uses vectors to directly overlay the spot patterns, this can be either automatic, manual or both. Once the spot patterns of each image are in the same coordinate space, the single spot map can be applied to any image in the analysis and matching spots will fall within the same outlines. The use of a single spot map for comparison of spots between gels and Western blots allows the use of objective filters to identify the presence or absence of a spot from a given image. 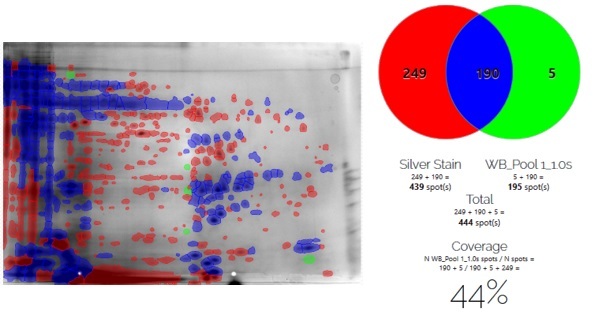 SpotMap can also be used for comparative analysis of gel images, for example; comparisons of total protein profiles of different strains or species. The number of spots present on each image is compared and the relative percentage coverage of spots between images is calculated.